Two really interesting papers have been published in the last couple of weeks which have really chimed with me, and they have happened to come at a time when my own work is evolving to encompass many of the issues raised, and will perhaps allow me to explore these issues further. Firstly, Counting What Counts, published by Nesta, and written by Anthony Lilley and Professor Paul Moore makes a convincing argument that the arts and cultural sector is neither properly collecting or making good use of data which could help us to understand and increase the social and cultural impact of our work – and importantly could enable us to to unarguably demonstrate the results achieved through the investment of not insignificant amounts of public money. This I think is really important to all of us working in arts education and the participatory arts sector. Everyone involved in this sort of work has stories about how engaging with the arts has ‘changed lives’. This is sometimes presented in the rhetoric of the evangelist in efforts to get across just how important our work is – only last week I attended a presentation in which colleagues who deliver an inspirational arts education programme in the States talked of ‘rescuing people’ through music. I don’t doubt any of these stories, or the essence of the many evaluation reports I see which assert that arts programmes have had effects on people’s lives which extend way beyond developing their artistic skills. We use reports and evidence like this to make the case for funding and investment in our work, and we are often required to produce them by funders to show the return we are delivering on their investment. And of course it is vital that we do hold ourselves to account, when we are usually spending public funds or other people’s money. I may write another time about the way we do this, the sophisticated models that we do have in place, and we do have many – from extensive quantitative data collection and analysis, to those individual and often inspiring case studies. However, amongst the issues raised by the Counting what Counts is the fact that this so often happens in isolation. We don’t have mechanisms or infrastructure in place to look at the really big picture – the ‘Big Data’ which has the potential to really change practice and influence at the highest level. The other primary issue is related to what we do collect and why, and the fact that it is, as mentioned above, so often seen as the way of justifying our work and existence, and not as a fundamental tool which we can use to inform and shape decision making. In recent months a combination of things, some work related, have led to me paying more attention to science stories in the news. Another thought I had, whilst reading this paper was how many arts project evaluations are actually subjected to the rigorous standards that any scientific study would be before being published and accepted by the scientific community. I am sure it happens and that there are pockets of good practice, but there is a strong case to be made for an arts education resource and training provision which helps organisations with areas such as statistical analysis. How often has it been demonstrated that the effectiveness of an arts project in achieving social impact is statistically significant? – I’d be really interested in any examples of such evaluations. There is also a case to be made for a peer review system as is standard for publication of all scientific papers. With the Counting What Counts report still very much on my mind, I was really excited to read that Dr Ben Goldacre had written a paper advocating for use of random controlled trials in educational contexts, and, again for the building of an infrastructure echoing the now well established mechanisms that exist in the medical world. The paper speaks for itself and can be read here. If the arts education world were to take some of these points on board we could really add weight to those inspirational case studies and be in a position to make scientifically proven arguments about the effectiveness of our work in schools, communities and other contexts in addressing social issues and genuinely making the world a better place. This as ever will take time, but I’d urge anyone who has the opportunity to do research and evaluation around their work with the arts to think as scientifically as they can, and I hope that the Arts Council and other major bodies take both these pieces of work seriously and are able to help the sector build the infrastructure and develop the skills which will be required for the realisation of the potential impact of these pieces of work. In his keynote speech at the Royal Philharmonic Society awards, the people’s conductor Gareth Malone, said ‘I think that classical music is better than the rest. It’s better than folk, it’s better than drum and bass, it’s better than rap.” Tempted though I was to blog vehemently about that at the time, I didn’t. Surrounded by the entire classical music industry, after a good meal and wine, it’s easy enough for such things to slip out. I think that Gareth in all probability would say, in a different context, that there is good and bad music of all types, and that what is good in one context can be entirely wrong in another. Certainly to my mind one of his many gifts is choosing appropriate, and usually ‘good’ music to encourage the people he is working with to take their first tentative steps as musicians. I would be surprised if he were to follow through on his statement and only ever use Western Classical music when working with his choirs, be they of young people, military wives or any other background. So, I’ve long argued that good music is good music, and my own musical life has reflected this. As someone passionate about music education, and convinced that making music can empower and enfranchise people, bring out undiscovered personal qualities and develop the skills needed for success in any walk of life, I’ve always been unconcerned about what the music that does this should be. There’s not something magic about playing a Beethoven Symphony – in some contexts it will indeed be playing in an orchestra, in others a band in a mates garage, a folk club session or a freeform jazz improvisation. The key thing is it has to be as good as it can be – it’s the commitment and dedication, blood, sweat and tears that it takes to do it well which will truly develop the elusive ‘transferable skills’ and enable individuals to translate musical participation into empowerment. The challenge of those of us setting up and leading music education activity is to ensure the pleasure and satisfaction outweighs the pain caused by the hard work. On Midsummer’s day, a week long celebration of one of the most extraordinary cultural institutions began in Stirling. I am not going to add much to the many descriptions of El Sistema, Sistema Scotland, or England’s In Harmony programme here, but readers seeking background on this may well want to start with this this Guardian piece and accompanying video. I shared the open air performance in Raploch through BBC4s broadcast. It was very much a display of the commitment, dedication, selflessness, teamwork and sharing that first convinced conductor Jose Antonio Abreu, and later Edinburgh’s former bishop Richard Holloway, that the orchestra was a model which could transform communities. 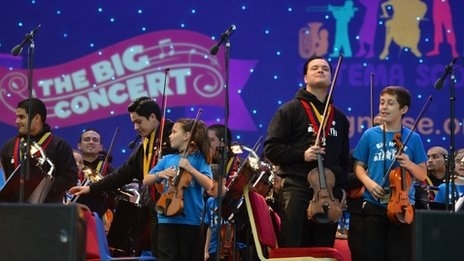 The concert was an extraordinary, and potentially life changing moment for the performers and audience alike. However I was a little troubled to find a tiny Gareth Malone sat on my shoulder that night saying ‘see, I told you classical music was best’. Of course, it was Purcell that the youngest Scottish players approached with infectious enthusiasm, and Beethoven that stilled a Scottish crowd and overcame unseasonable weather. When the stakes are high – and this programme aims to help whole communities overcome some of the biggest social problems – is it a case of only the best – only classical music, will do? Later that week, I watched BBC3s Project Hackney in which Plan B, Labrinth, and Leona Lewis worked with young people who had been excluded from mainstream education. The programme finished with scenes of their performance of music they had produced themselves. The pivotal scene for me was Plan B telling the group words to the effect that ‘it’s only going to be good if it’s good, people won’t make allowances for who you are’. In the end it was good. Despite my initial suspicions of the intentions behind this project, it had integrity – my only concern is to know how committed the BBC are to ensuring it has a legacy, and that the young people are enabled to continue on this course which may just have got them back on the rails. This week, in a Hackney Community centre, some of the 150 young people who regularly work on the Barbican and Guildhall school’s drumming project have been collaborating with young Brazilian musicians from the Pracatum school to develop new material which will be performed in their communities, and at this weekend’s Back2Black festival at Old Billingsgate market. The Pracatum school bring their own take on Samba and other Brazilian music – the Barbican project has, for over four years, been built on the premise that the young musicians build material from the sounds they relate to as young twenty first century East Londoners. Beats lifted from Grime and Hip Hop are woven into their powerful performances – and they will be a key part of this November’s major performances Unleashed which will explore their dreams and the realities of their East London. Evident in the rehearsal room this week, and sure to resonate with audiences at the weekend, are the same qualities – commitment, sharing, selflessness, dedication – that were present in Raploch a week ago, and the evidence and testimonies from people that have been part of this project over the years show substantial impacts on the individual and on the wider life of their school communities. I’m not going to make a judgement that any of the projects I’ve talked about here are better than the others, but I finish these thoughts more confident than ever that making music together does have the power to impact communities and change individuals lives; pleased, that on this evidence, good project design, inspiring leadership and integrity are more important to the success of this area of work than the musical medium chosen, and happy to continue my genre crossing musical existence, whatever Gareth says. 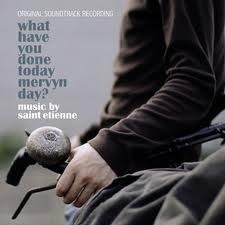 Writing about Jonathan’s work and the transformation of the Lee Valley in my last post reminded me of Saint Etienne’s film What Have You Done Today, Mervyn Day? Made in 2005, the film is set on the day following the announcement of London’s successful Olympic bid and follows the teenage Mervyn on a bike ride through the Lee Valley and the area now dominated by the Olympic Park. With scenes and voiceovers featuring the real life characters of the area the film was a timely documentation of a landscape and community on the brink of transformation through one of the biggest developments in London’s history. Scenes which stick in my mind include one in a warehouse, which may well no longer exist, filled with the largest imaginable collection of tiles piled floor to ceiling in haphazard and frequently collapsing piles, and Mervyn being served bubble and squeak in a classic East End cafe – another rapidly dying institution. Built into the narrative are reminders of the Lee Valley’s industrial past, including the invention of plastic in Hackney Wick. I haven’t seen the film since its premiere in 2005, during which the band played the soundtrack live (and also played their excellent album Tales from Turnpike House in the second half) but there’s a trailer on YouTube – with a tantalising hint of a DVD release this year in the comments. The film is well worth trying to seek out, and already and important historical document. Walthamstow based artist Jonathan O’Dea has a new exhibition opening this weekend at the Waterworks in the Lee Valley Park. I’ve known Jonathan for a few years now and we’ve spent the odd evening in the Rose and Crown talking, I am sure very wisely, about art and music, amongst other things. One subject we both keep returning to is Waltham Forest’s position on the edge of the city – and the way that this perhaps denies this part of London the identity and attitude of its East London neighbours, or the home counties security of adjoining Essex. 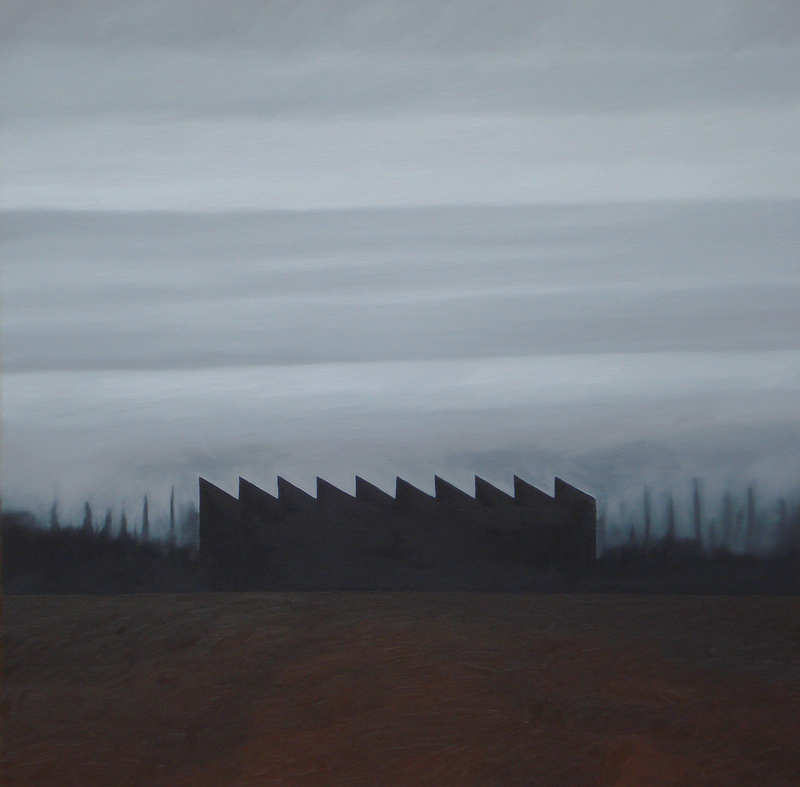 The first exhibition I saw of Jonathan’s work seemed to me to directly reflect these themes – a series of abstract landscapes on whose horizons shimmered objects which may have been trees, or could have been industrial buildings. Perhaps these were echoes of this part of the East End’s memories – of the factories and warehouses which were cleared from the Lee Valley when work began on the Olympic Park, or maybe they were natural features which have been covered up by the urban sprawl – future echoes from the utopian world of William Morris’s News from Nowhere. Jonathan took some of these ideas further in a show at Walthamstow’s Vestry House museum last year. In London is London – England is England the St George’s Cross rose above those abstract landscapes – a symbol of a national identity which this Irish artist struggles to perceive in 21st century London – England, for Jonathan, doesn’t assert itself until way beyond the M25. When I visited Jonathan in his studio a few weeks ago those landscape canvasses were stacked in racks in the corner – and he has clearly compartmentalised that work mentally as well as physically. The pieces he was working on for this exhibition are strikingly different. 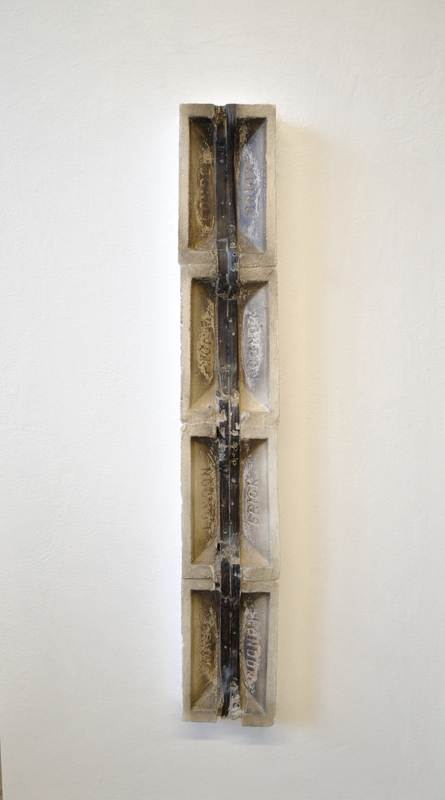 Jonathan has had free reign to remove junk and waste from the Lee Valley park and has produced a series of pieces using materials he has found there, or reclaimed from disused rooms in warehouses. Wooden pallets have been transformed into organic looking structures, bricks neatly mounted, painted, and then partially annihilated. Wooden materials are made to look metallic and old disused pipe work is newly painted. 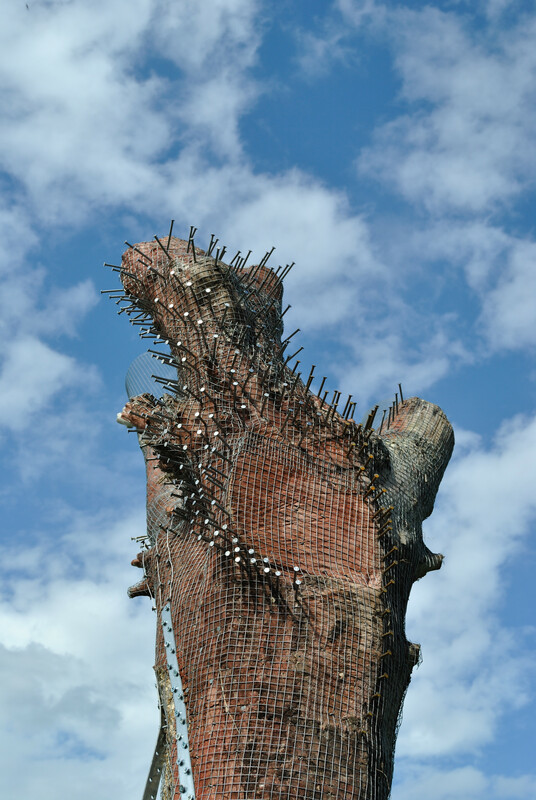 The most ambitious piece in the show will be a large site specific sculpture in which a slowly decaying tree is encased in a wire mesh. As this piece rises at the edge of the glistening Olympic park and those transformed pieces of rubbish are mounted as artworks near to where they were once abandoned, this show promises to encourage viewers to reflect on the way we change and transform the landscapes around us, to imagine how the ground beneath our feet was once different, and wonder how future generations will transform the places we know so well. Images of artwork from London is London,England is England (2011) and Changing Spaces (2012) used with the permission of the artist. Collaboration is certainly a buzz word at the moment. In the current climate working together is presented as a way of maximising shared resources and reducing overheads – from neighbouring local councils sharing services to open source software developed by volunteers across continents – when joining up works it can be of benefit to all. This is an area of particular interest to me, both because I work for two organisations which have realised the potential benefits of collaboration and decided to work together,and also because a lot of our work at present is exploring the process of collaboration in artistic practice, along with its many challenges and potential pitfalls. Last week I was involved in helping put together an event at the Barbican – The Secrets of Successful Collaboration. This session was part of the Digital Shoreditchfestival, and was itself a collaboration between us and the digital consultancy Unthinkable Consulting. We had put together three case studies of different types of collaboration, which provided an interesting range of contexts to think about the issues surrounding working together, and to explore whether there were commonalities, rules, or secrets which apply at all levels of collaboration across sectors and at different scales. The first project which was discussed was the consortium of companies collaborating on an Internet radio project with speakers from Totally Radio and Mixcloud. They were all working in the same area – all had different skills and specialisms which they bought together with the shared aim of strengthening the way which their sector worked and addressing some fundamental problems which affected them all. SecondlyPunchdrunk , the extraordinary immersive participatory theatre company, discussed their collaboration with MIT media lab. The mutual aim here was to explore how technology could be used to link people attending their show in the real world with participants in the virtual world. Was it possible to create the intensity of a Punchdrunk experience in someone’s front room? Could interacting over a computer make someone terrified, excited or transported into another world? They ran a small scale pilot within the New York presentation of their show Sleep No More which required the Creative application of new technologies which linked pairs of real world and virtual participants. The fundamental starting point for both collaborations was that all parties involved were genuinely invested in the outcomes of the projects – if the projects were successful, each partners area of work would be enabled to move forwards to a new place. I found it interesting that early on in the internet radio project one of the partners had walked away, mainly because although their knowledge would help the collaboration, they didn’t feel they would get enough out of it. There was a shared understanding of each others worlds – in the Internet Radio project this was perhaps inherent as all the organisations were working in a relatively specialist field. In the Punchdrunk project it was interesting to hear how those working on the technology became immersed in the narrative of the show – as having an understanding of this directly informed the technical solutions they created. Neither of the collaborations challenged or threatened any of the partners core business – success would help everyone, failure would be disappointing and of course time, effort and money would have been lost, but everyone involved could walk away without having lost everything. I think this is key because it enabled a high level of risk. Although layers of complexity were added on top of Punchdrunk’s core business of producing an extraordinary show, the core experience for their ticket buyers was not fundamentally changed. Similarly as the consortium were working away the Radio Player and Mixcloud people could still get on with doing what they do…. Nothing was said about money. I am sure there were various deals and agreements between the partners in both case studies, but it was not the jumping off point or the reason for the collaboration. In her introduction to the evening Sarah Turner from Unthinkable referred to a quote that collaboration between two arts organisations was ‘the suspension of mutual loathing in pursuit of shared funding.’ I don’t know where that originates from, but I wouldn’t mind hazarding a guess about how that collaboration turned out. The third case study took a relatively small digital consultancy, FridayFriday, working with a large company – the coop. This was essentially an exploration of a client/ customer relationship – a very different dynamic from the other two case studies. It had clearly been a successful and happy relationship, which resulted in the consultancy delivering work of which they were proud and with which the client were happy. There were some really interesting insights into the way Friday got to the heart of what the client wanted – for example everyone who works for them can draw! However, where one party is buying services from another, does this really provide the basis for a true collaboration? Interestingly the client in this relationship were not present to speak at the event itself. The event ended with a few short call outs from people looking for collaborators – the one which sticks in my mind was from The People Who Share – whose underlying philosophy is essentially that we – people – will have to work together a lot more to survive much longer, whether through sharing the planets resources or sharing knowledge to solve the problems we face now and in the future. This ‘Sharing Society’ is going to have to just become the way we live – which is why it is worth us trying to get to the heart of what makes a successful collaboration. The SHM Foundation – an organisation passionate about social change – have recently published a report into the riots. Alongside hundreds of thousands of words out there on the subject, this may seem unremarkable, but this report does have the distinction of coming after a considered period of time, and, even more importantly is largely the work of a group of diverse young people, who generated the ideas, carried out interviews with their peers and produced the final report. The document states that 20-25% of the young people whose views are included were involved in the riots.